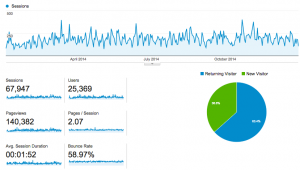 You should be looking at and analyzing your website traffic periodically. But especially this time of year, we can crank the date field back to January 1st and get a year-at-a-glance. Pay attention to events that drive traffic, traffic sources, and trends in technology (operating systems and screen sizes) used to access your website.